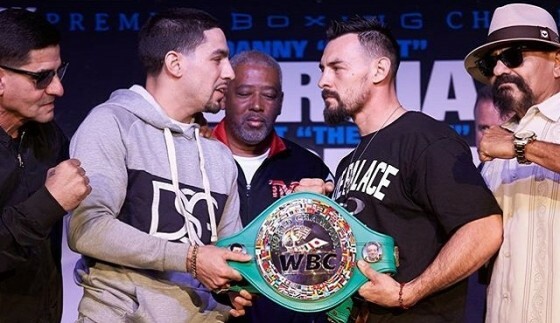 On Thursday afternoon, the final press conference was held ahead of this weekend’s Danny Garcia vs. Robert Guerrero showdown. The match, pitting two former world champions vying for the vacant WBC welterweight title, will take place as part of a Premier Boxing Champions telecast on Fox from the Staples Center in Los Angeles, Calif.
During his time on the dais, Guerrero’s father and trainer Ruben took a few swipes at Angel Garcia, Danny’s father and trainer. Ruben has been talking quite a bit these past few weeks, partly due to the manner in which Garcia has claimed his Puerto Rican heritage in previous fights, and party because that is simply what he does best. In return, Angel didn’t back, as the two men had to be separated while on stage. To add a little tension to matters, Danny and Robert could be seen jousting over the WBC belt as the presser closed.